Short chapters alternate among three young evacuees in East Prussia during the winter of 1945. A fourth voice also fits into the storyline. Joana, Florian, Emilia, and Alfred are aboard the Wilhelm Gustloff when it is hit by a Russian torpedo and quickly sinks. The story leads up to this moment when life-changing decisions are made. We get to know, love, and understand the differing life circumstances that have brought these characters together from all over Eastern Europe at a crucial time in the war. Ruta Sepetys has a talent for drawing tears from her readers and little known stories from history. 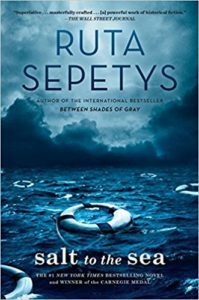 Between Shades of Gray exposed the tragic story of the Lithuanian prisoners in Siberia with the same drama and sensitivity that she tells this story of the sinking of the Wilhelm Gustloff. The epilogue in Salt to the Sea adds another poignant note to this moment in historical fiction.